The CycleSafe ProPark Bike Locker system is modular. It is available as an individual bicycle locker or a locker bank. A single locker holds two bikes. 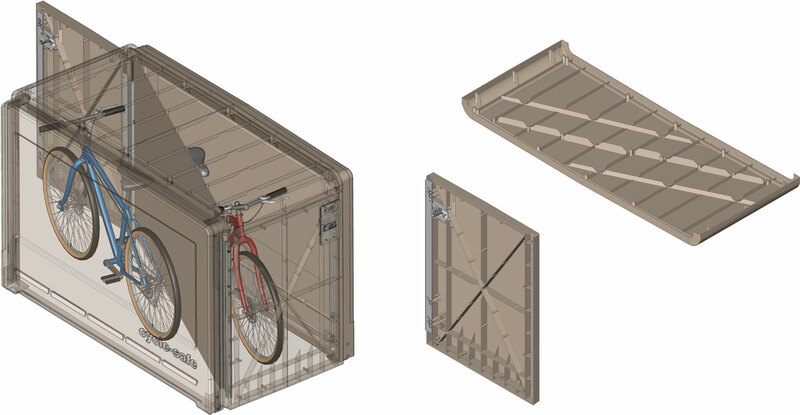 A locker bank has expandable capacity for anywhere from four to fifty-six bikes. You order only the units you need, then can add lockers at any later time. Bicycle lockers provide the highest security bike storage, Class I long-term parking with protection from theft, vandalism, and inclement weather to encourage cycling as a means of transportation. CycleSafe bike locker systems offer benefits to the cyclist and facility manager with storage bins, promotional panels, and a range of configurations to meet site, budget, and security requirements. Contoured radial edge design provides a contemporary, stylish appeal. Each unit has a door on each side with a diagonal partition to create two space efficient triangular stalls to secure one bike per door, or a single door unit without an interior partition for one or two bikes per door. Extremely durable, these lockers are compression molded with modern structural-grade composite materials which are non-corrosive, rust free, impact resistant, and with a grafitti/UV resistant polyurethane enamel paint finish. Patented high-security locks provide peace of mind and dependability that promote use. Serving cyclists worldwide, CycleSafe first installed bicycle lockers in 1980 for the City of Ann Arbor; these have since been relocated and are still in use today. CycleSafe builds lockable, permanently anchored bicycle lockers. Our patented design is impenetrable to pry bars and keeps out rain, wind, snow, and fire. CycleSafe’s high-strength, Compression-Molded Structural Composite (SMC) produces a virtually indestructible product whose life span is measured in decades, not years. Our automated process eliminates out-of-spec parts, ensuring that every CycleSafe bicycle locker provides 100% weather resistance, rigidity, and security with uniform construction. With more than 35 years of history behind us, we can prove it: CycleSafe lockers provide the lowest cost of ownership over long term use in the industry. Attractive and functional, CycleSafe lockers are the top choice of designers worldwide. Our flush-molded surfaces with ergonomic finishes and tones that blend into the most sophisticated environments with ease. The CycleSafe ProPark® series bicycle locker is designed as a uniform row of lockers with clean sight lines. The bike locker design and engineering was carefully thought out to make the expanded locker bank appear as one solution. Because the construction details are unique, we received a US Patent for the concealed interlocking components that make a more attractive curb appeal. CycleSafe Bike Lockers showing structural ribbing.